The new HPVC season has begun! For some time now we’ve been working on the design for next year’s bike. Looks like we have some fun stuff in the mix. We also have a large enough team to have two bikes again this year. Current Items: Prototyping, Fundraising, Fundraising, Design, and Fundraising. This year’s competition will take place in Montana, probably sometime in April. Exact dates have yet to be determined. We had a great competition! Aside from some trouble during our travels and a few bike problems during the competition all went smoothly. Maverick placed 6th overall and Goose placed 5th. More pics/information to come. Needless to say we had a great time! Thank you to all our sponsors who made this competition possible! The UNR Human Powered Vehicle Team is well on its way to completing the final bike! I can’t wait to get some laps in on it! Our innovative fairing design for this year incorporated the use of flat panels made from carbon fiber. This technique allows us to build the entire fairing in less than a week. Below is a mock-up of the full size fairing using cardboard cutouts. Not only will we be going fast, we’ll be doing it with style!! Stay posted for the unveiling of the final bike, Maverick! The prototype part 5 or 6 or whatever number we are on now, has officially been ridden by the team’s very own test pilot! The design is looking great and with a few minor tweaks to the steering and drivetrain we should have a fully operational bike up and running by the week’s end. A few teasers of the newest design will be posted within the next few days, so stay posted to this site! Final bike design is well under way and physical testing of our Rollover protection system should begin sometime in the next two weeks. The competition is looming ever closer and the UNR Human Powered Vehicle Team is getting stronger by the day! As always, the hunt for sponsors continues! Be sure to take a look at our Sponsorship page for information on how you can contribute to the team! Prototype Build Continues; Sponsors Still Needed! 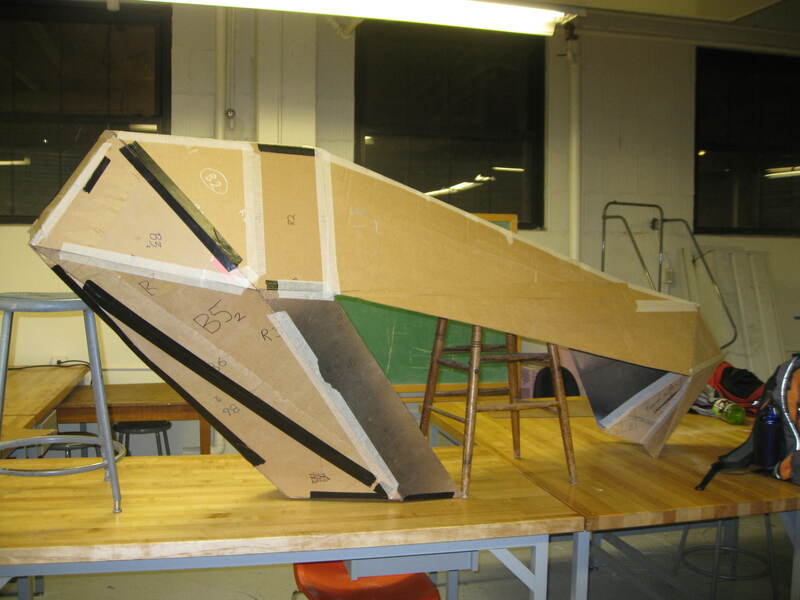 The spring semester has started and the prototype build is nearing completion. Photos and updates of the team’s progress through the semester can be found right here, so stay posted! The best way to stay connected to the UNR Human Powered Vehicle Team is to subscribe to our website! If you are a student at UNR and want to help out with the team or just come and see what were all about, meeting times are scheduled as Monday, Tuesday, Wednesday at 6:30 in the Palmer Engineering Lounge. Going into the semester, we have a lot of work to get done, as always we are in need of your help! If you are a local northern Nevada business and would like to contribute to the team’s efforts this year, click over to our sponsor page and contact us with your info. We will send you an information packet detailing how to sponsor the team. All sponsors are represented through stickers on our vehicle’s outer shell and display of their logo on our homepage. Those sponsors donating over $1000 receive a much larger sticker on our travel trailer. This trailer goes with us to every competition and, for the remainder of the year, is parked in the upper lots at a perfect location for football season tailgate party advertising. Back the Pack and become a sponsor today! 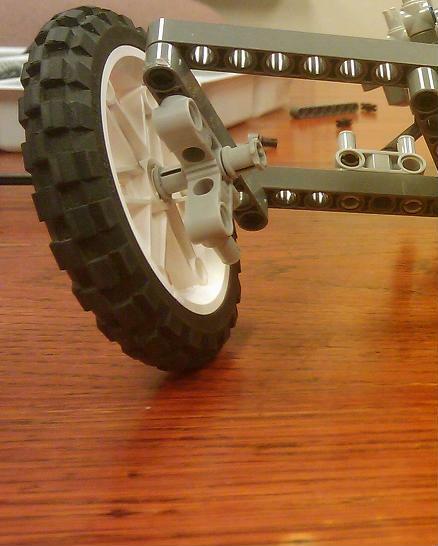 Okay, so it’s just a lego model, but the basic fundamentals of our prototype design have now been determined and the team is ready to start building the second iteration of The UNR Human Powered Vehicle! Building with Legos proved to be the most effective way of manipulating our design ideas, as having six people gathered around a computer screen looking at a digital model could only spark so much creativity. A digital model will be built in SolidWorks for all necessary safety analysis and FEA, pictures will be up as soon as this is completed. Prototype 2.0 construction will begin next week while we try to hold true to our goal of having a finished product by start of school. The team is very confident in our latest design and while it may need some tweaking, it will be by far the most innovative bike at this year’s ASME Human Powered Vehicle Challenge. School may be off for the next month, but that wont stop the UNR Human Powered Vehicle Team from continuing towards their goal of winning this year’s ASME HPVC Competition! Prototype analysis and improvement will continue through break, and it is expected that we will have our second prototype iteration completed by the start of Spring semester. As always, we are in need of more sponsors. Please take a look at our sponsorship page for more information and don’t hesitate to contact us for more information on the team or if you have any questions on how to sponsor the team. Happy Holidays from the UNR HPVC Team! Qdoba Mexican Grill hosted a fundraising event for the team three weeks ago. 20% of all purchases made by customers presenting this flyer were donated to the UNR Human Powered Vehicle Team. We cannot thank the Qdoba on North McCarran enough for helping the team out on their quest for 1st place at this year’s ASME Human Powered Vehicle Challenge! Directions to the participating Qdoba Restaurant can be found below. 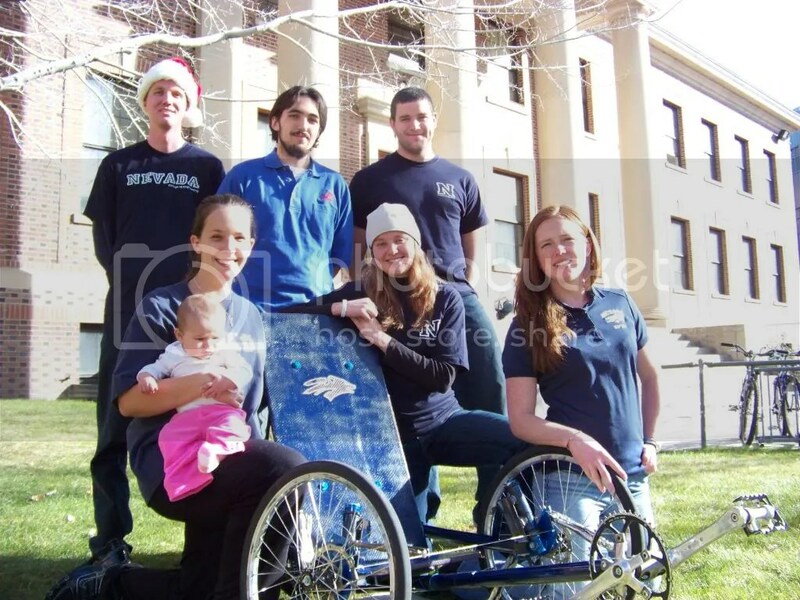 A photobucket gallery showing the newest pictures of the UNR Human Powered Vehicle Team has been created! As of now, we have built 3 mutant bikes, 3 carbon fiber test pieces for rollbar model verification, and are nearly complete with the first prototype of this year’s frame. Be sure to check the link to keep up with what goes on down in the depths of the Palmer Engineering Building! The frame team has been working diligently over the last few months on frame design and how their vision is becoming a reality! Prototype building has begun and the Palmer Engineering basement is a buzz with pipe cutting, welding, classic rock radio stations, and pizza. The prototype will provide proof of concept to the main design feature on this year’s human powered vehicle. Once the prototype is finished we will begin testing and analysis on the design and begin working towards the final bike’s development. Pictures of the prototype will be uploaded as soon as they become availiable, so continue to check the team’s website for updates.